Frustrated by the continuing surge of Central American migrants at the border, President Trump this week embarked on a dramatic shake-up at the Department of Homeland Security, pushing out Secretary Kirstjen Nielsen and other high-ranking officials. Trump reportedly asked Nielsen to submit her resignation after a contentious Oval Office meeting she’d requested in order to plan “a way forward” at the border. Her ouster came just two days after Trump pulled his nomination of Ronald D. Vitiello to lead Immigration and Customs Enforcement, with Trump vowing to find someone “tougher.” The administration also forced out Claire Grady, DHS’s undersecretary of management and second in the line of succession, to make way for Trump’s preferred pick to become acting secretary. Kevin McAleenan, the commissioner of Customs and Border Protection, will now take the reins at the department, which has 240,000 employees and a $50 billion budget, and is also charged with protecting the U.S. from terrorism. Trump blamed Nielsen for failing to stop the growing influx of Central American asylum seekers, berating her during Cabinet meetings and calling her at home in the mornings to demand tougher action at the border. When Nielsen protested that some of the things Trump wanted her to do were illegal—such as simply refusing to hear asylum requests from migrants or reinstituting family separations—Trump became irate. Don’t blame the president for demanding results, said Jonathan Tobin in the New York Post. Central American migrants are exploiting our laws, and it’s the Homeland Security secretary’s job to figure out how to stop them from doing it. Life is undoubtedly hard in countries plagued by extreme poverty and gang violence. But “the proposition that everyone living in those nations has a right to live in the United States, because it offers them a better life, is absurd.” Trump should keep firing people until he finds someone willing and able to stop the flood of migrants. 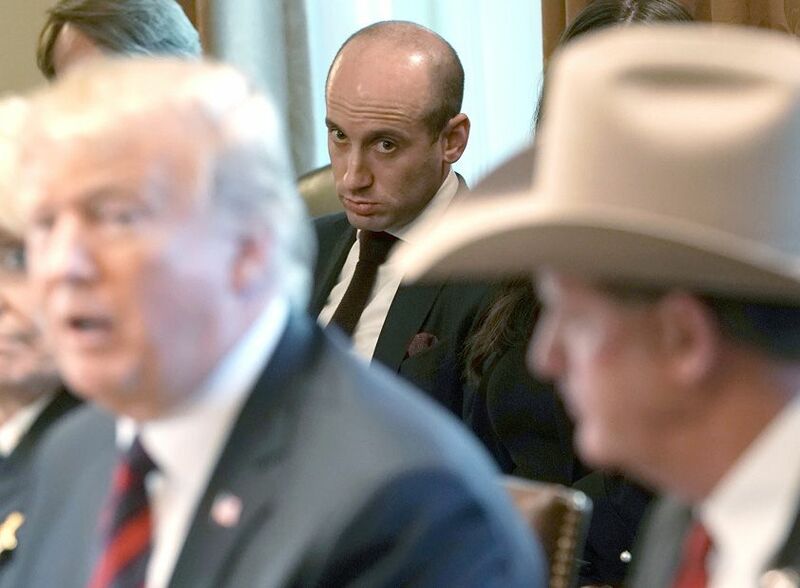 Why not just appoint Stephen Miller to run DHS? said Max Boot in The Washington Post. Nielsen tried to put a civilized face on Trump’s uncivilized policies, only to find out it was impossible to satisfy our deranged president without breaking the law. In the end, even Nielsen had “some vestigial loyalty to the Constitution.” Trump should have the courage of his “racist convictions” and give his 33-year-old nativist adviser the formal responsibility for the radical policies he advocates, which include ending birthright citizenship and major cuts to legal immigration. Cover illustration by Fred Harper.